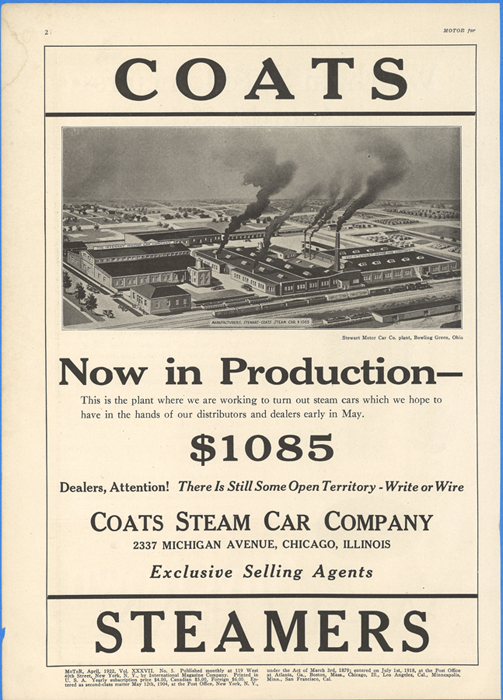 Coats Steam Car Company, Coats Steam Motors, Coats Steamer Wisconsin Steamers, Inc. 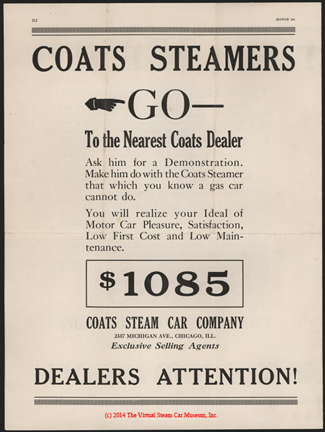 Despite wide publicity, few Coats Steamers were marketed. The car was powered by a 3-cylinder engine of Coats' design, and, unusually for a steam car, it had a 2-speed and reverse shift with floor change. A touring car was the only model available. The Y. F. Stewart Motor Car Co. Bowling Green, Ohio. Karl Petersen is engaged in an effort to fully document the Coats story. Please connumicate with him if you have information to share. 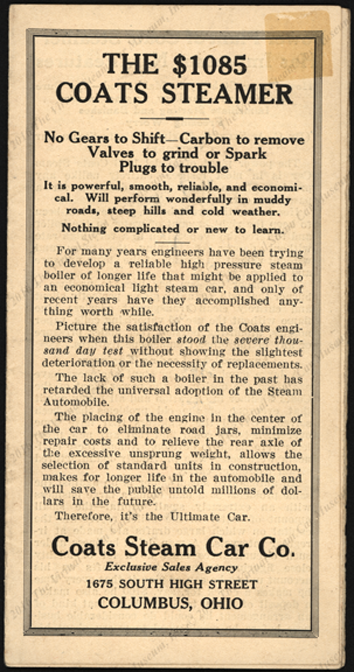 The Coats Steam Car Company promoted itself as early as September 24, 1921 in this Automobile Topics, article on page. John A. Conde Collection. 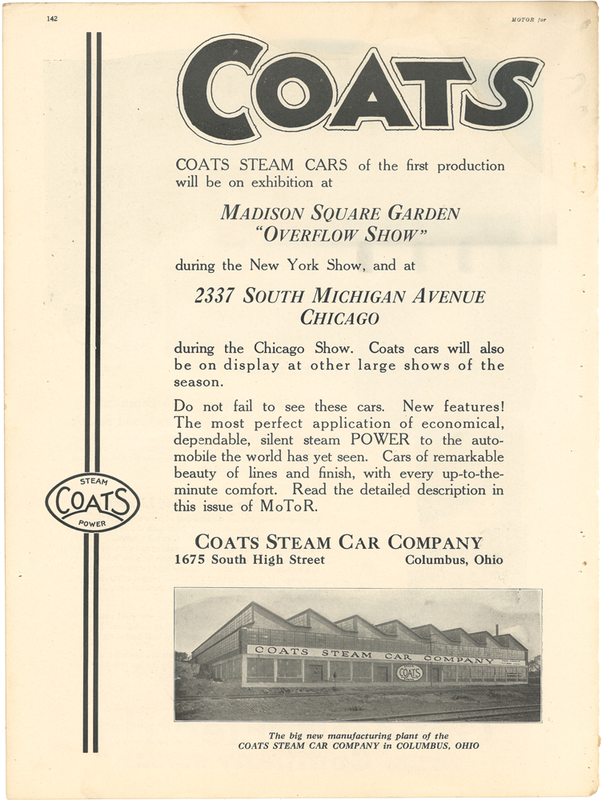 By Octbober 1, 1921, Coats had produced and was distributing a brochure. 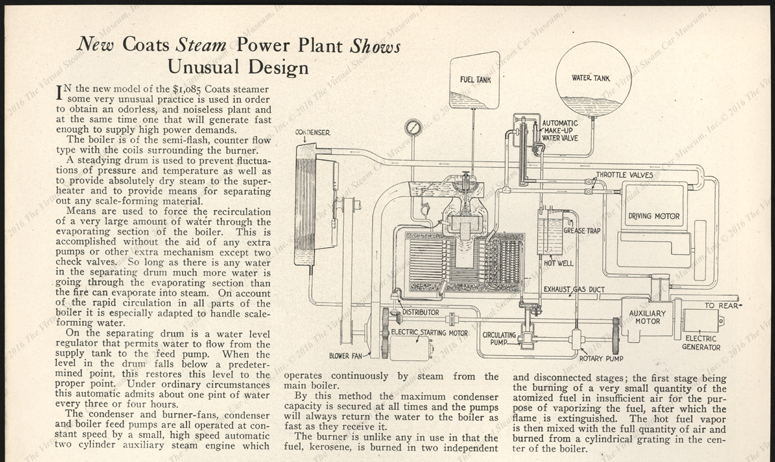 The photocopoied letter describes a six-cylinder steam powered car. Edward Gibbs Collection. The VSCM has a second copy of this letter and the brochure below, which came together. This suggests that the letter and the brochure may be reproductions. 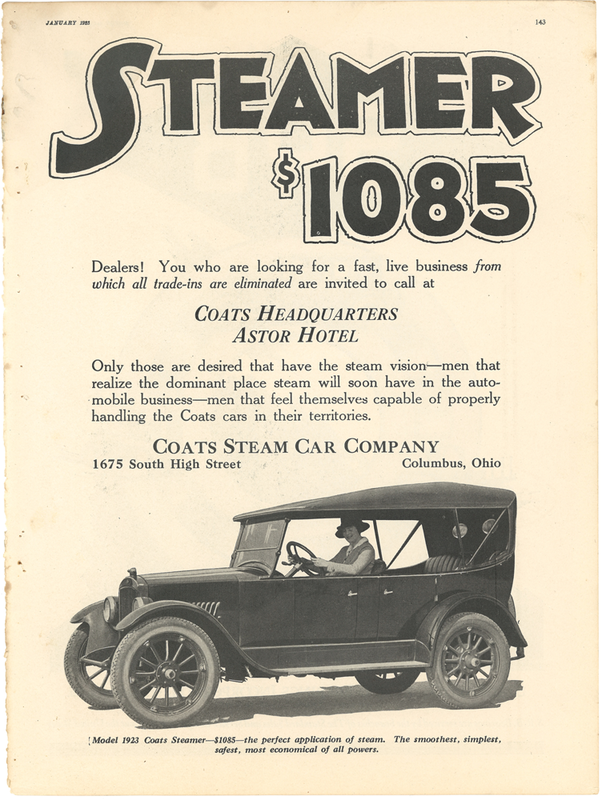 The corporate name "Coats Steamers, Inc. Indianapolis, Indiana" suggests this trade catalogue was printed in 1921. 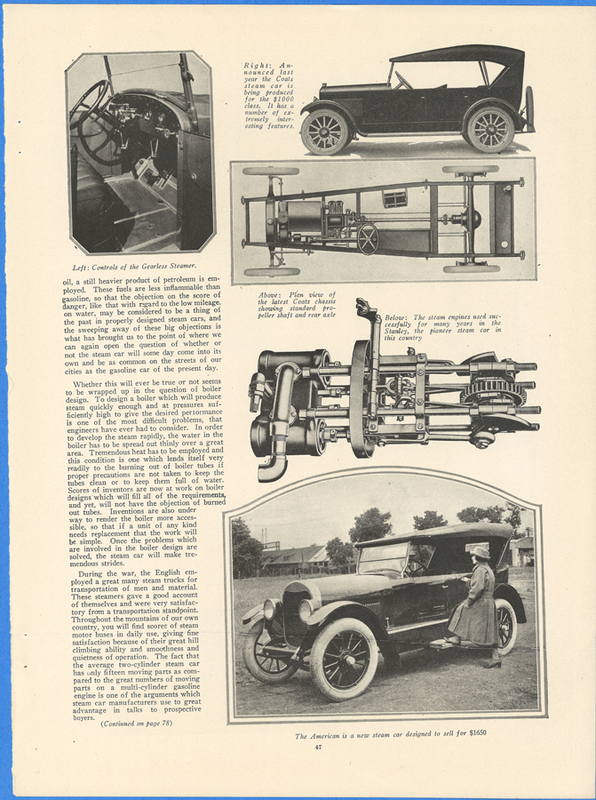 Coats Steam Car Company, November 1921, Motor Magazine, pages 35 and 74. 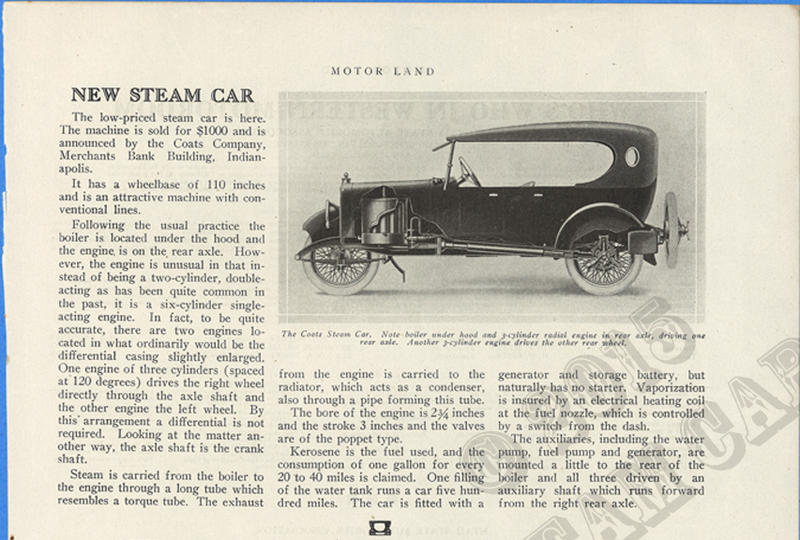 Motor Land magazine carried this Coats Steam Car article in May 1921, p. 21. 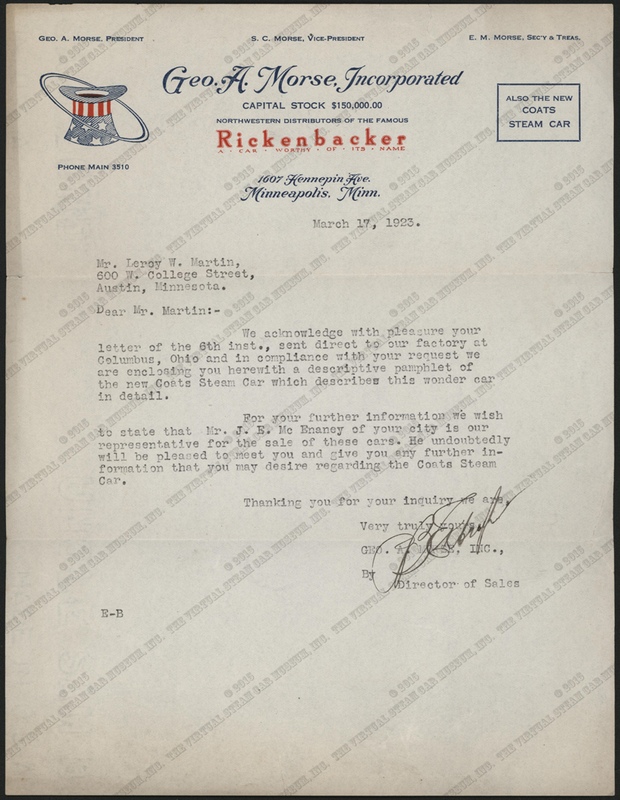 This stock information request card quoted a New York Herald artilce of September 18, 1921. "The relationship of the addressee, "R. A. 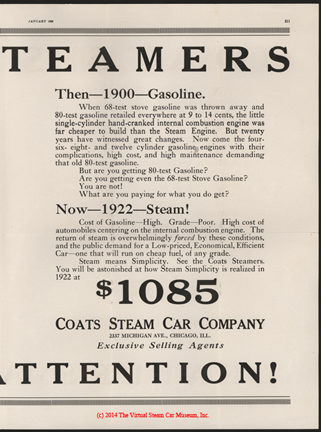 Day," to the Coats Steam Car Company is unknown. John A. Conde Collection. 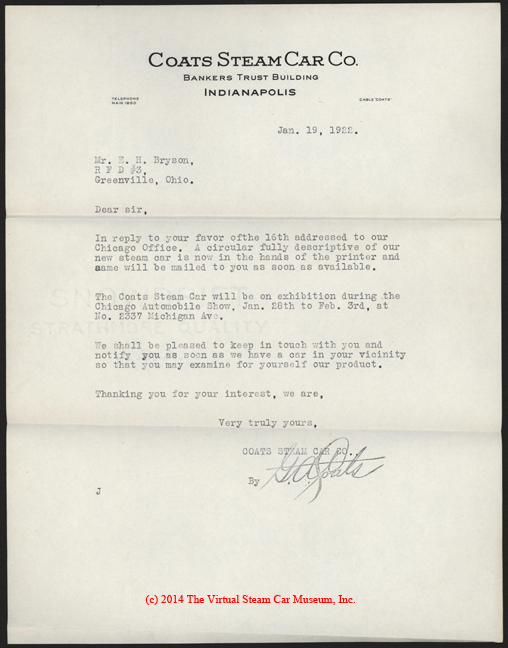 George A. Coats responded to an inquiry from E. H. Bryson with a letter and information package on January 19, 1922. The package included a brochure and four full-page magazine advertisements. The advertisements read "Dealer Attention!" (See Below.) The envelope documents the Company's changing corporate structure. 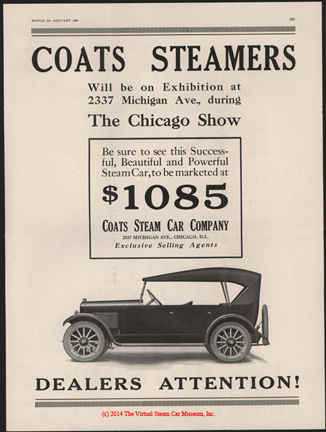 The name "Coats Steam Car Co." is typed above the name "Coats Steamers, Inc.," which is crossed out. The typist was apparently unfamiliar with the shift key. 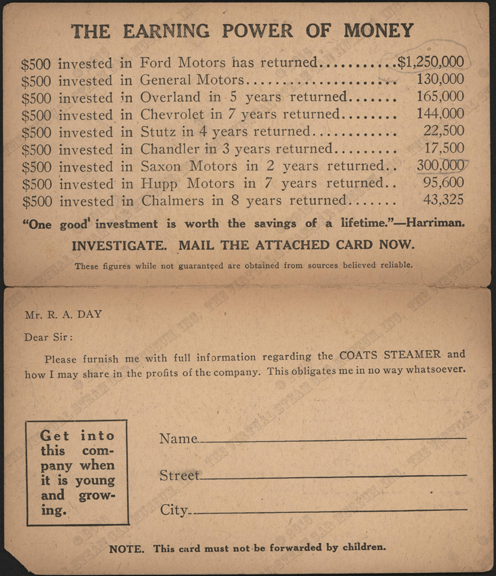 George Coats mailed this four-page advertisement from Motor Magazine to E. H. Bryson on January 19, 1922. Bryson had written to Coats, perhaps expressing an interest in being a dealer. 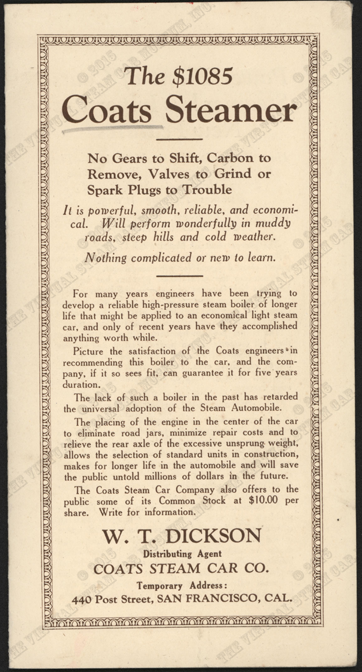 The Coats Steam Car Company placed thsi four-page advertisement in Motor Magazine of January 1922. It ran from page 209 to 212. George A. Coats January 19, 1922 letter to E. H. Bryson (above) references a brochure that is still at the printers. It is likely this small pocket-sized brochure that features a picture of Coats and comical characters. This copy carries a "Wisconsin Steamers, Inc." stamp on its back page. 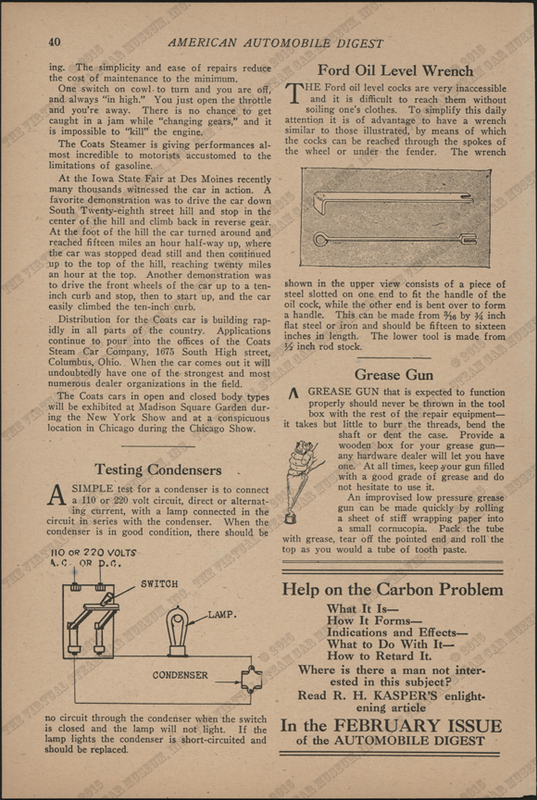 A company identifying itself as "Wisconsin steamers, Incorporated" placed this full-page advertisement in Wisconsin Motorist about 1922 or 1923. The advertisement references the Wisconsin State Fair, which is held at the end of the summer. 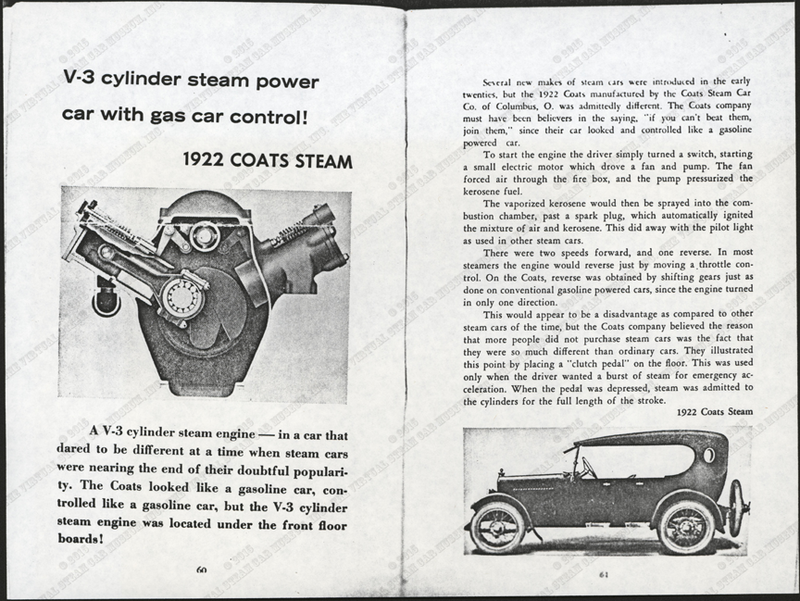 Floyd Clymer featured the 1922 Coats Steam Car on pages 60 adn 61 of his Steam Car Scrapbook. Photocopy. John A. Conde Collection. 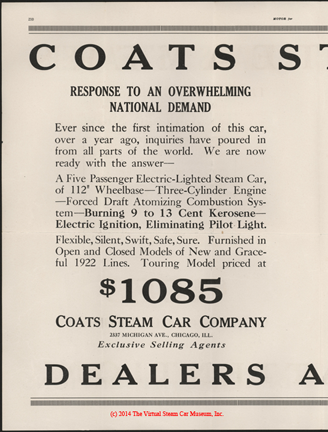 Coats advertised in the Locomobive Engineers Journal for APril 1922. It is clearly in the style of the Company's small brochure. 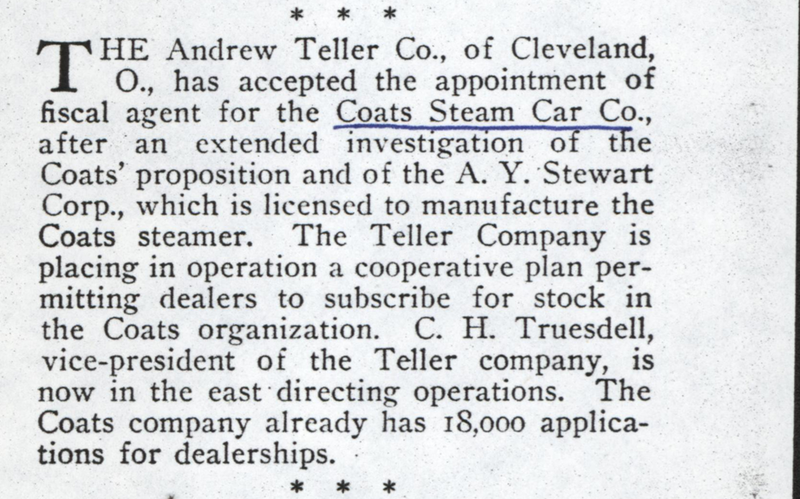 Auto Topics for April 8, 1922 carried this short article about the Coats Steam Car Company acquiring the Stewart Motor Car Company factory and the car being marketed as teh Stewart-Coats Steam Car. John A. Conde Collection. 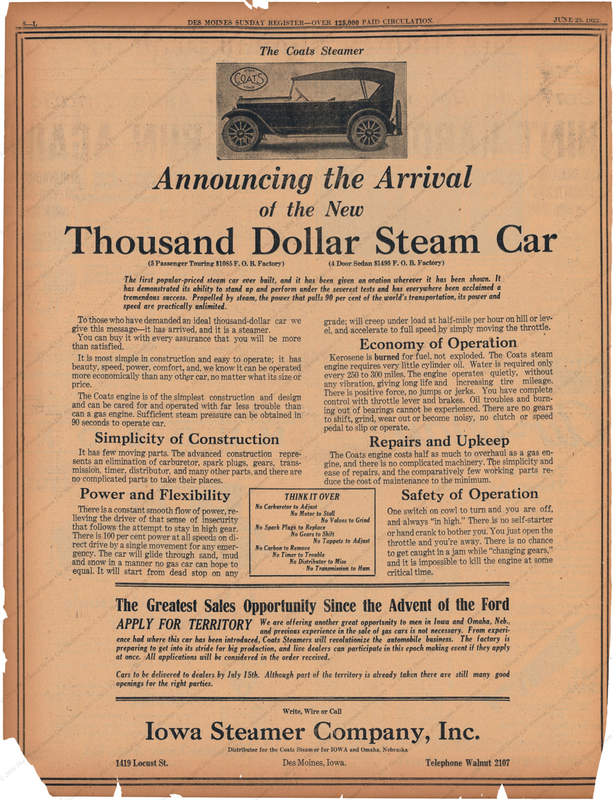 The Coats Steam Car Company took page 2 of the April 1922 issue of Motor magazine to promote its new factory and claim that the car was "NOW IN PRODUCTION." 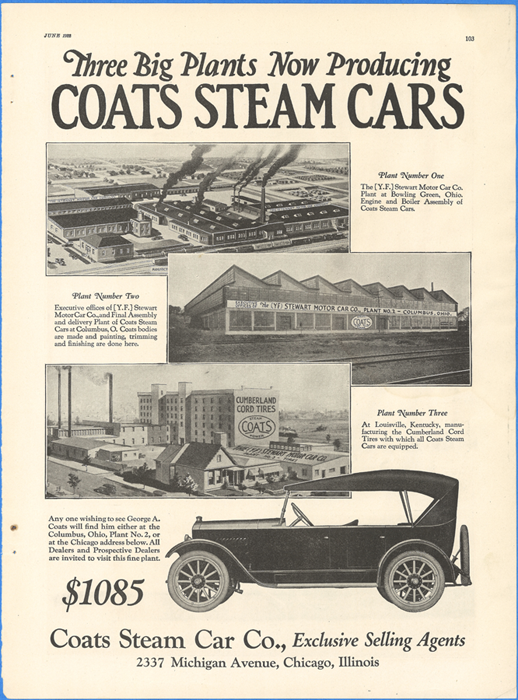 In May and June 1922, the Coats Steam Car Company again promoted its production capabilities in its Motor magazine advertisement, pages 79 and 103 respectively. 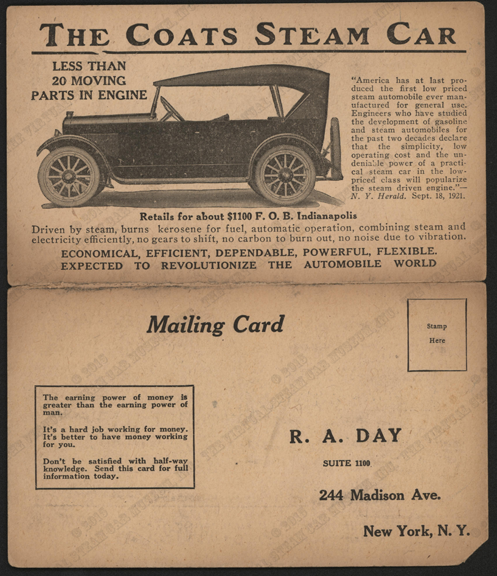 Floyd Clymer reproduced this advertisement in his Steam Car Scrapbook, p. 169. There is a copy in the John A. Conde Collection. 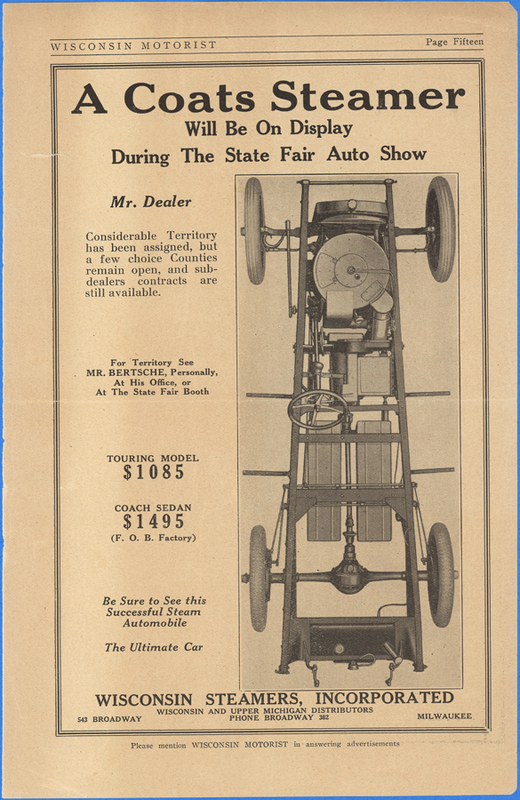 On June 25,1922, The Iowa Steamer Company advertised in The Des Moines Sunday Register for dealers to sell the Coats Steam Car. 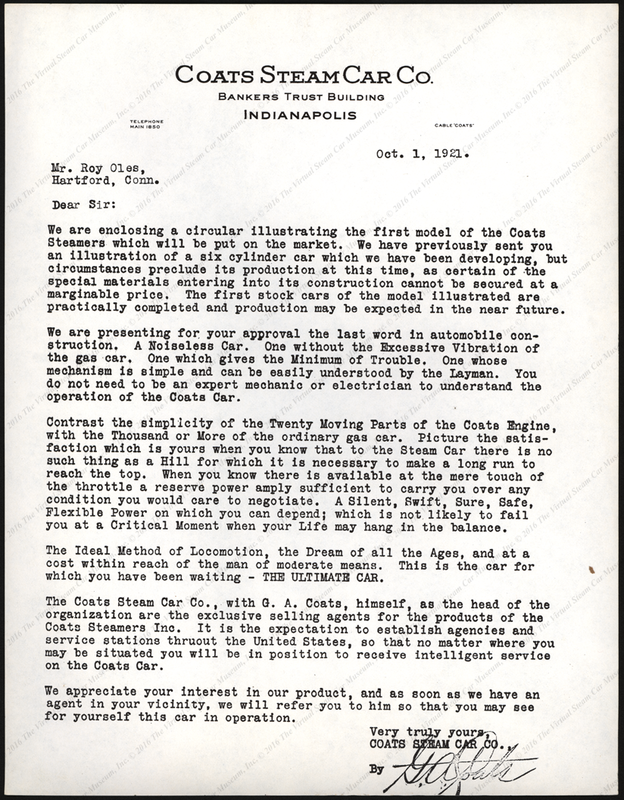 In October 1922, George Coats released information to the American Automobile Digest clarifying the relationship with the Stewart Motor Car Company, p. 83. 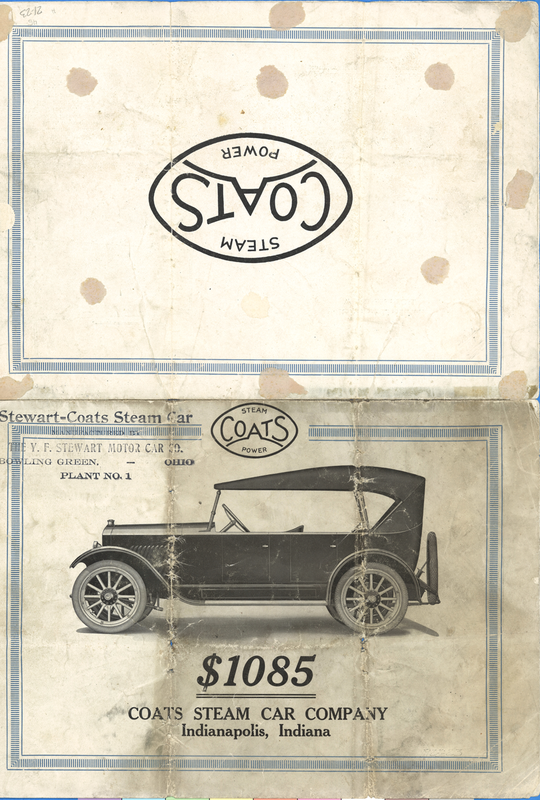 Coats claimed that the Stewart Motor Manufacturing Company was licensed to produce Coats-designed cars. John A. Conde Collection. 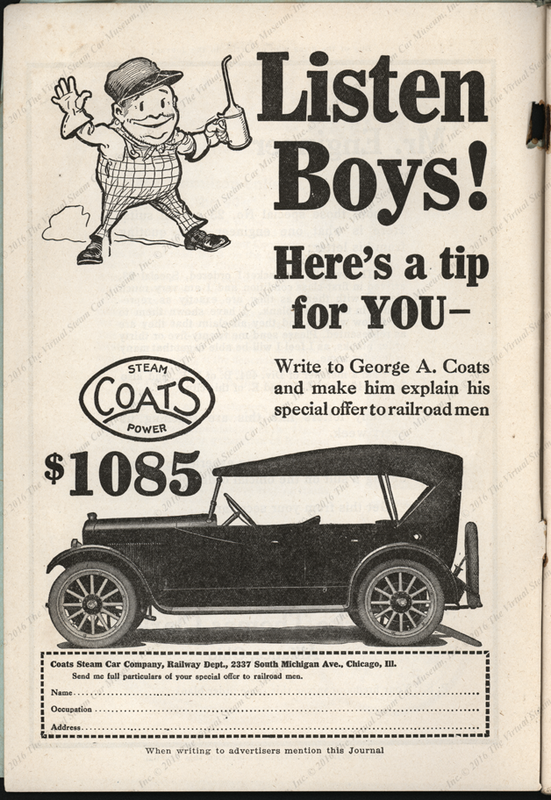 By December 1922, the Coats Steam Car Company was apparently under investigation, as reported by Motor Magazine, p. 60. The investigating agency and the nature of the investigation are unclear. John A. Conde Collection. George Coats posed with Miss America, Mary Katherine Campbell, in the January 1923 issue of American Automobile Digest, pp. 39 0 40. John A. Conde Collection. 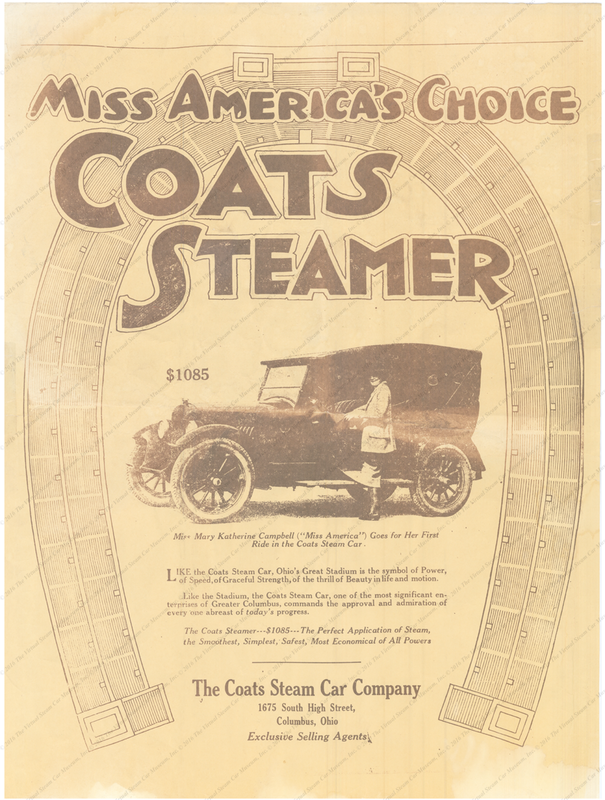 This large poster probably dates from 1923, as it features Miss America taking her first Coats Steam Car ride. 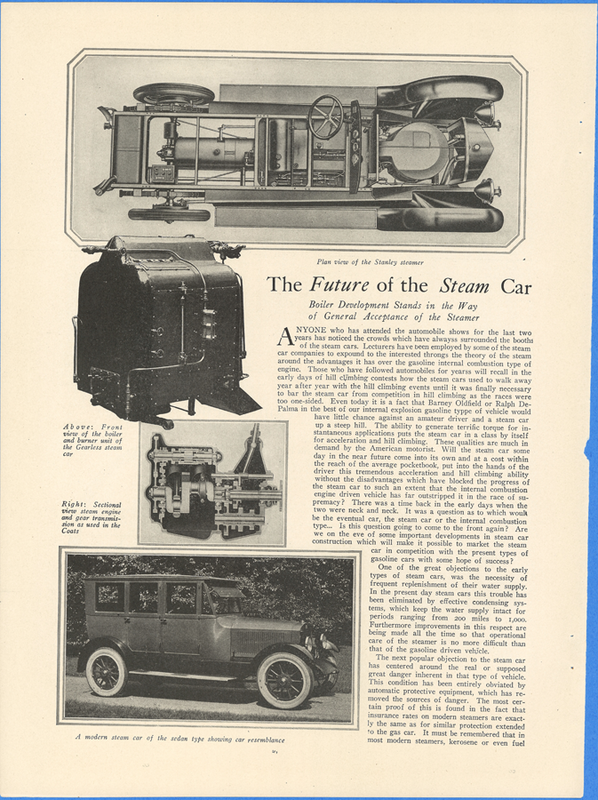 The Coats Steam Car was featured in an article entitled "The Future of the Steam Car" that appeared in Motor magazine for October 1922, pp. 46, 47, & 78. 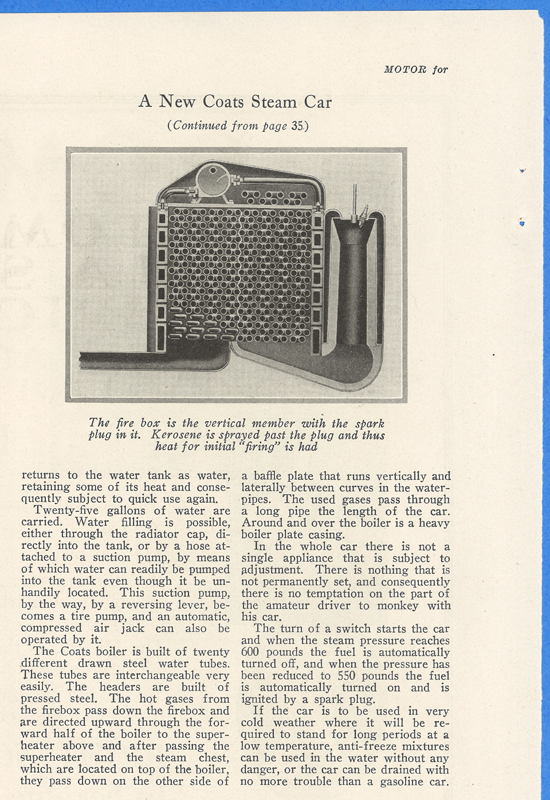 The article also featured the American Steamer and the Stanley. John A. Conde Collection. 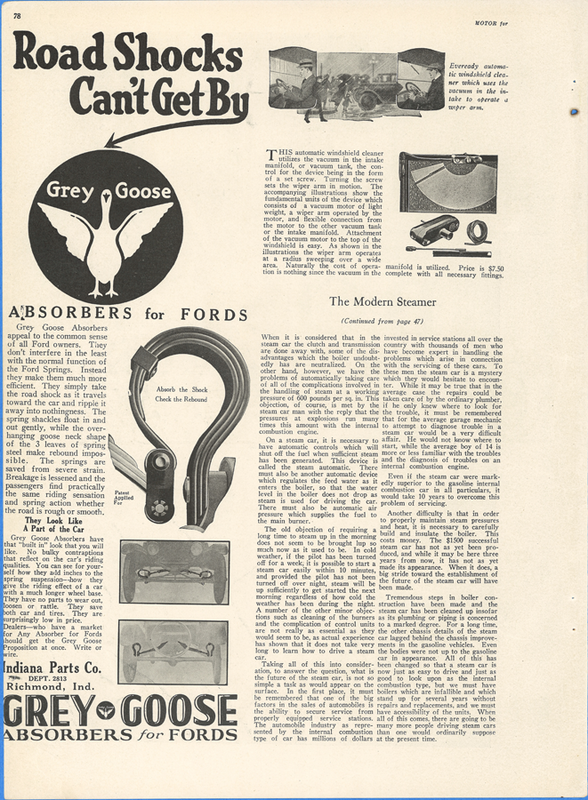 Motor Magazine featured the Coats Steam Car Company in this January 1923 article, p. 414. 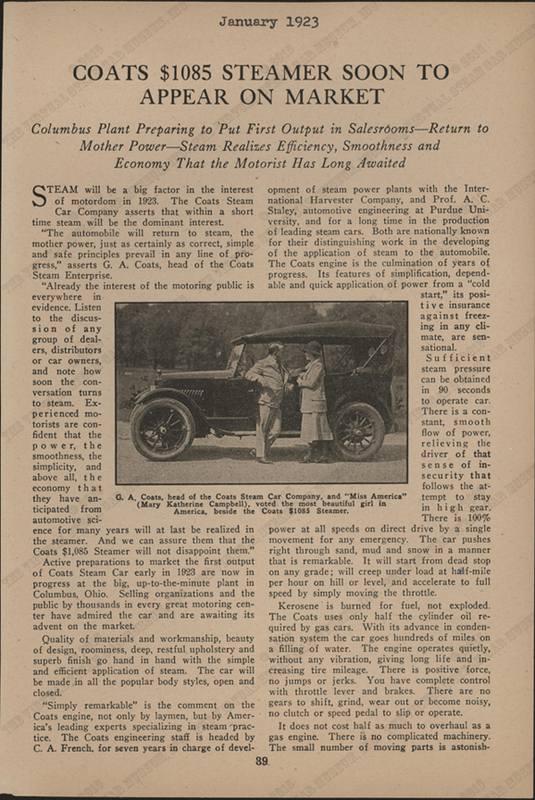 Coats Steam Car Company, April 1922, Motor Magazine, p. 2. John A. Conde Collection. 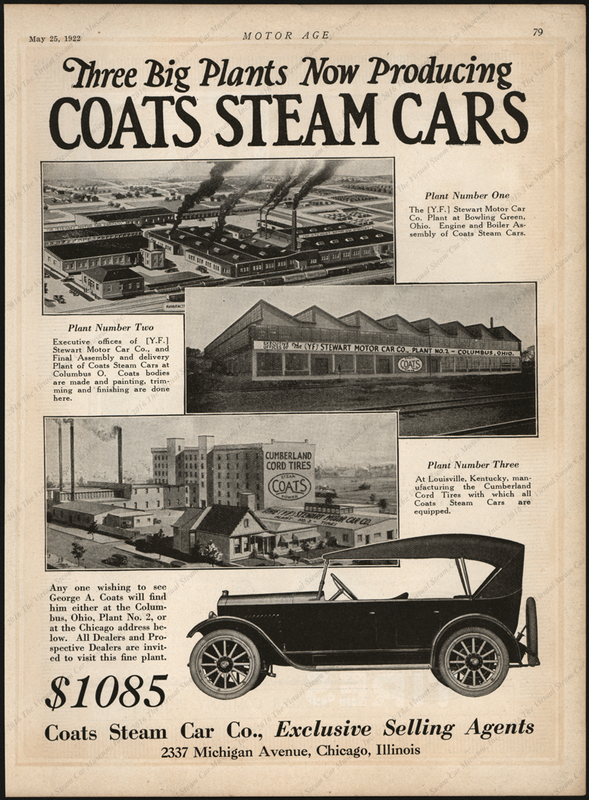 These two Coats Steam Car trade catalogues are based on the same template. The catalogue on the left (Edward Gibbs Collection) is the company's standard, while the catalogue on the right is the San Francisco, CA dealer's version. 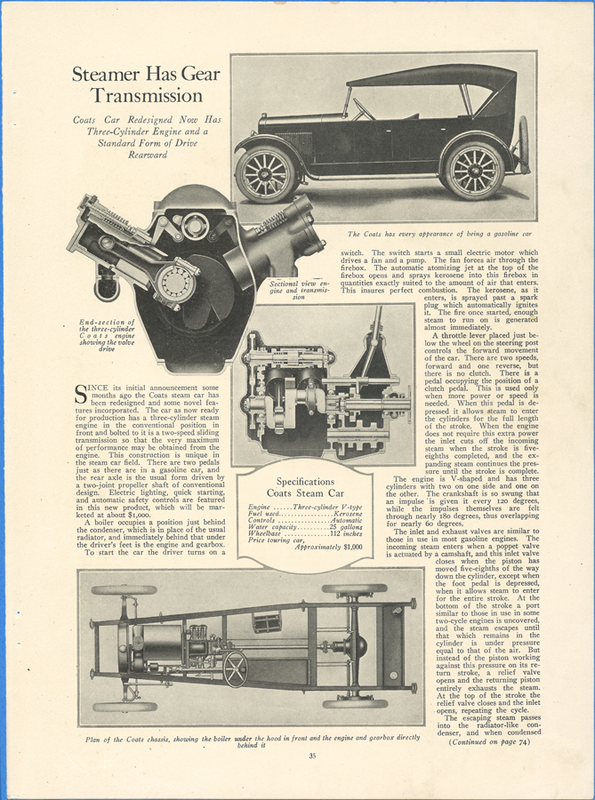 This two-page advertising spread appeared in Motor for January 1923 on pages 142 - 143. The address is listed as 1675 South High Street in Columbus, OH. 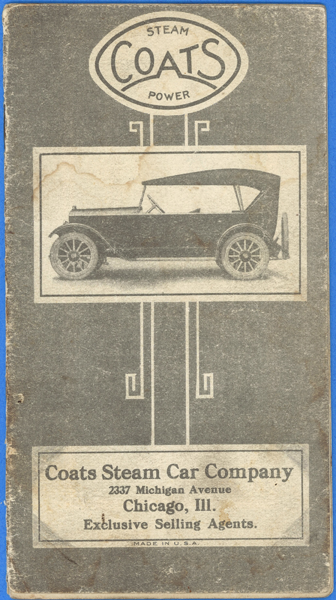 This trade catalogue carries an identification stamp reading "Stewart-Coats Steam Car, The Y. F. Stewart Motor Car Co. Bowling Green, Ohio, Plant No. 1." 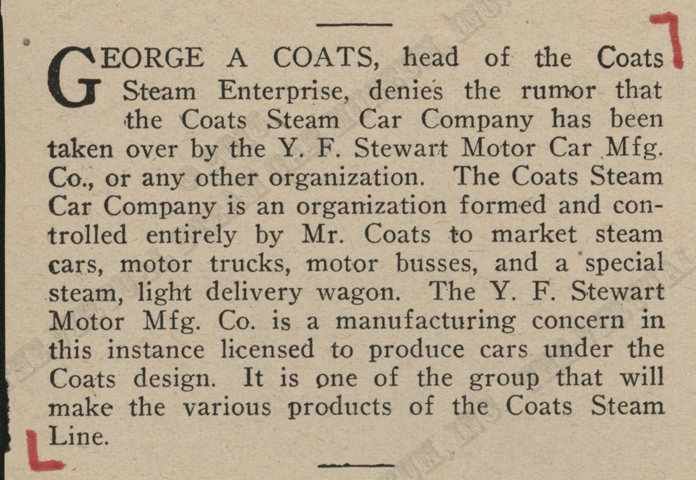 This implies that Y. F. Stewart took over the Coats Steam Car, but only additional research will tell. 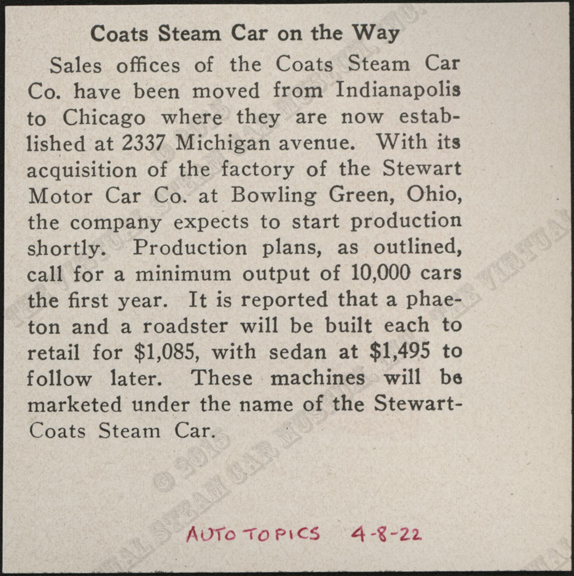 In March, 1923, people were still interested in purchasing Coats Steam Cars. The Director of Sales for George A. Morse, Inc., wrote to Leroy W. Martin in Minnesota, telling him to get in touch wtih Mr. J. E. McEnaney, the local dealer. John A. Conde's File Folder. John A. Conde Collection. Georgano, G. N., Encyclopedia of American Automobile, (New York, E. P. Dutton & Co., 1968), p. 45. The Society of Automotive Historians bestowed its •	restigious 2015 Ingersoll Award on the VSCM web site. 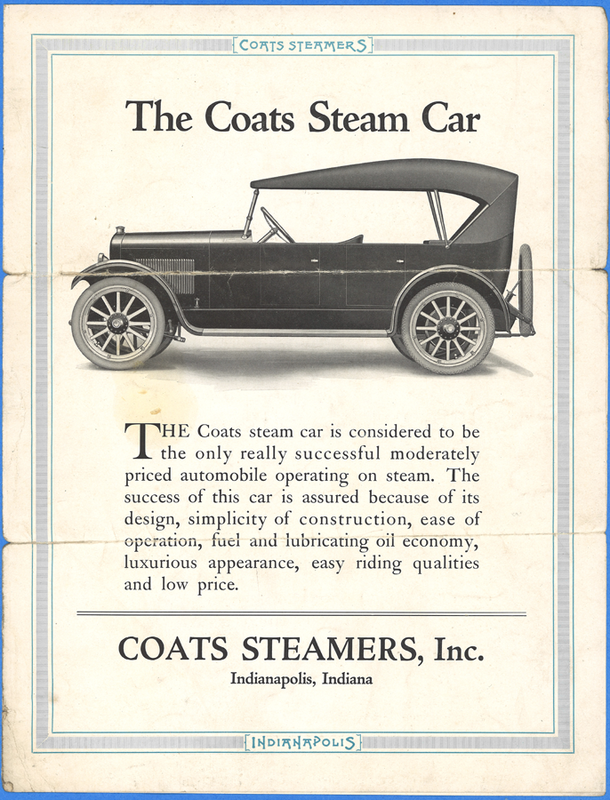 Contact us if you have additional information about the Coats Steam Car Company, or if you have questions.